When emissaries from a world called Yount offer Barnabas a chance to redeem himself, he accepts their price—to voyage to Yount with the key that only he can use to unlock the door to their prison. But bleak forces seek to stop him: Yount's jailer, a once-human wizard who craves his own salvation, kidnaps Barnabas's nephew. A fallen angel—a monstrous owl with eyes of fire—will unleash Hell if Yount is freed. And, meanwhile, Barnabas's niece, Sally, and a mysterious pauper named Maggie seek with dream-songs to wake the sleeping goddess who may be the only hope for Yount and Earth alike. 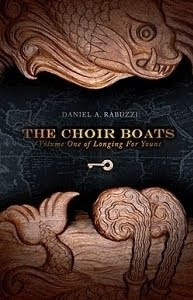 The Choir Boats was selected by January Magazine as a Top Ten YA Novel for 2009. Reviewers describe it as “Gulliver’s Travels crossed with The Golden Compass and a dollop of Pride and Prejudice,” and as "a muscular, Napoleonic-era fantasy that, like Philip Pullman's Dark Materials series, will appeal to both adult and young adult readers." This special edition of the novel includes bonus illustrations by Deborah A. Mills. It's also DRM-free, so it can be read on any platform compatible with PDFs, and shared with friends just like a regular book. I've officially put this book on my Amazon wishlist. It sounds like an awesome read, don't you think? You can find out more about the author at his website.